Four basic objectives guided the approach to screen for drugs that modulated the "CREB pathway." First, for efficiency, the screen had to be high throughput, amenable to robotic manipulations in a 96-well plate format. Second, because any identified drug was ultimately to be used in humans, the preferable target was an endogenous (neuronal) form of human CREB. Third, when designing the screen, all the relevant upstream signaling pathways that might impinge on CREB function during memory formation were not yet known. Therefore, a broad-based screen, monitoring CREB-dependent gene expression as a functional readout of the CREB pathway seemed more inclusive of any missing, yet potentially important, biochemical signaling. Finally, the screen needed to identify drugs that had no effect on CREB function alone but rather synergized with co-activation of cAMP signaling. This requirement was designed to mimic the original behavioral experiments. In flies, overexpression of CREB alone had no effect on fly behavior. Rather, training per se was required to produce enhanced memory, because experience-induced increases in neural activity activated the cAMP pathway. These considerations were incorporated into a high throughput screen (HTS) of cultured human neuroblastoma cells, which were stably transfected with a CRE-luciferase reporter gene (Figure 7). In this manner, changes in CREB-dependent transcription of luciferase could be monitored via fluorescence. 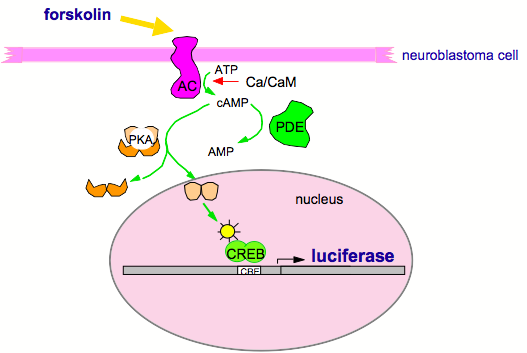 To mimic (at the biochemical level) the associative requirement for memory formation, drugs were sought that produced no change in luciferase activity on their own but synergized (> 2-fold) with a suboptimal dose of forskolin, which activates the cAMP pathway (as does neural activity in vivo). Using a robotic system to screen these cells in 96-well plates, large libraries of drug compounds have been screened efficiently, yielding numerous "active hits." To confirm, these active hits then were assessed at four different concentrations with or without forskolin. Several Confirmed Actives emerged from this screening process. Figure 7. Drug Screen For CREB Pathway. A human neuroblastoma cell line was genetically engineered to carry a CRE-luciferase "reporter" gene, which makes the cells glow yellow when CREB is activated. These cells then were grown in 96-well plates, exposed to drug compounds for four hours and then stimulated with a suboptimal dose of forskolin (which activates the CREB pathway). Compounds that did not stimulate CRE-luciferase on their own but that synergized with forskolin stimulation were chosen for further study. From this screen, DNS has selected seven CREB pathway enhancers and two CREB pathway suppressors for further study. Interestingly, an efficacious molecular target was discovered to be phosphodiesterase-4 (PDE4). Generally and specifically, this discovery makes sense. Most biochemical pathways function within a well-regulated optimum, with some molecular components accelerating (positive regulators), and others retarding (negative regulators), signal propagation. Given the opposing functions of CREB activator and repressor isoforms, this notion applies to regulation of the CREB switch during long-term memory formation. Like genetic mutations, most drug compounds actually serve as inhibitors of target function ("antagonists" for drugs and "hypomorphs" for mutations). Hence, discovering drug compounds that antagonize negative regulators of a pathway might be expected often from a screen for enhanced function. This, of course, is the case for a PDE inhibitor; decreasing PDE activity leads to an increase of cAMP normally synthesized by adenylyl cyclase (AC), and elevated cAMP leads to activation of CREB via PKA. Moreover, a PDE inhibitor might be expected to have minimal effect alone, in the absence of forskolin-induced activation of AC (or neural activity-induced activation of AC in vivo). Based on this initial observation, DNS licensed from Inflazyme, Inc. a chemically advanced PDE-4 inhibitor, HT-0712, for which Inflazyme holds a composition of matter patent and for which DNS has filed a use patent for cognitive dysfunction. Pre-clinical work on HT-0712 has shown it to be a validated compound for clinical development (see below). In all, three drug libraries were screened, totaling approximately 355,000 compounds. DNS has selected for further study several CREB pathway enhancers in addition to HT-0712. To date, behavioral assessments in rodent models of memory formation and biochemical experiments have shown them to enhance memory effectively and to work via different cellular mechanisms than HT-0712.